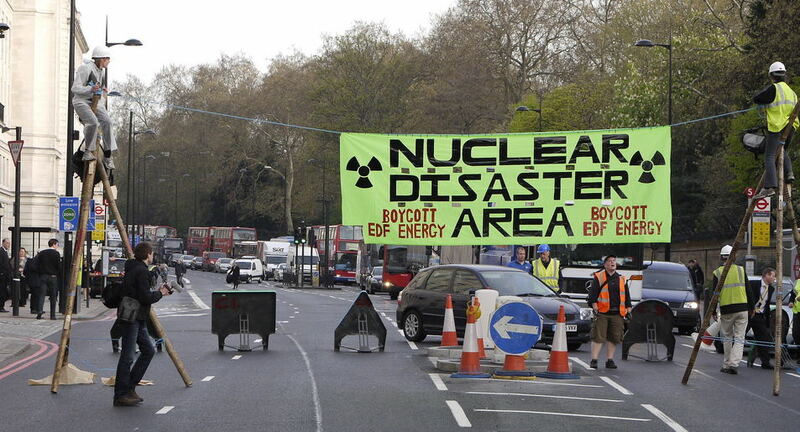 Campaigners brought rush hour traffic to a standstill on the morning of April 11 to protest against EDF Energy’s plans to build a new generation of nuclear power stations in the UK. 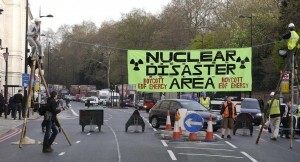 All four lanes of the A302 outside EDF Energy’s headquarters in Grosvenor Place – which runs alongside the gardens of Buckingham Palace – were sealed off shortly after 8 a.m. using 14-foot tripods. The cleared zone was then declared a “nuclear disaster area”. After seven hours, the police called a specialist team to erect scaffolding to bring down the two activists who were on top of the bamboo tripods. Once they were down, the pair were arrested and taken to the Belgravia police station. Campaign group, Boycott EDF, says the energy giant is spearheading a “nuclear renaissance” which could see the construction of at least ten new nuclear reactors – a move spokeswoman, Bella Benson, claims will spell disaster for the UK. EDF has already caused great concern – even before construction of “new nuclear” has started. An independent report published last year found that land designated for EDF’s two new mega-reactors at the Hinkley Point nuclear power plant in Somerset is heavily contaminated with enriched uranium. 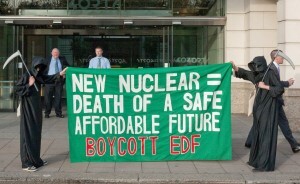 But EDF has dismissed the report. “With such a hazardous form of energy, best practice must be observed at every stage. We find EDF’s attitude shocking,” Benson concludes. The campaign is urging customers of EDF Energy to say “no to new nuclear” by switching to other energy providers. It is also asking the public to boycott events and attractions – such as the London Eye – sponsored by the company.